One only has to look around to understand why Singapore is often lauded as a city of innovation. The Singapore government is more than willing to invest in creative solutions by encouraging healthy competition and acknowledging the best of the best. This, too, is evident in the architecture scene in our country, where numerous designs have even gained widespread international recognition and clinched global awards. You, too, can enjoy the perks that living in Singapore has to offer by becoming a Singapore PR. From hugely popular aesthetic pleasers to perfect housing solutions, be inspired by these five amazing architecture landmarks. With its spectacular trio of interweaving blocks, the Nanyang Technological University’s spectacular School of Art, Design, and Media (ADM) campus building certainly more than reflects its own teachings. Located at Nanyang Drive, one of the ADM building’s most distinctive features is a sloping roof that is entirely verdant, seamlessly integrating the campus into the small enclave of greenery that surrounds it. What makes these roofs different from most other eco-architecture designs is the way that they flow into the ground, as if the building itself had somehow sprung from it. This simultaneously sleek yet serene campus houses classrooms, design studios, as well as a library — all of which aim to inspire its students by example. Officially named The Helix, the world’s first curved bridge is a stunning architectural landmark that has become a national icon since it first opened in 2010. Having been awarded the “World’s Best Transport Building” the same year it opened, the bridge is widely noted for its innovative structure and double helix design. The Helix is no mere worthless expenditure either. 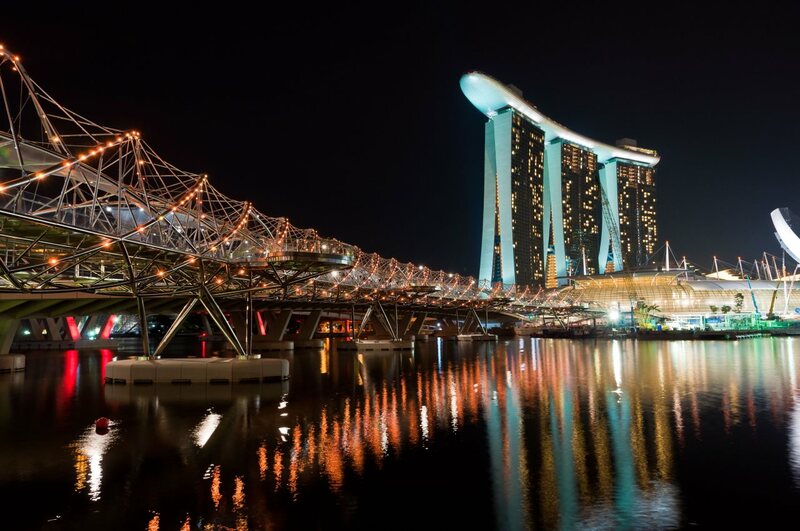 The start of its construction was an instrumental factor in the rise of the Marina Bay area as a waterfront hub, which ultimately saw a massive haul of investment the following year. Besides providing pedestrians coming from City Hall or the Esplanade with more immediate access to Marina Bay Sands, The Helix was strategically situated to provide pedestrians with phenomenal views of the city skyline. Multiple canopies are also cleverly incorporated within the bridge’s helical design to provide pedestrians shade from the elements while doubling as art galleries that feature works by local youths. As beautiful as it is during the day, though, The Helix truly comes alive at night when multi-coloured lights begin to illuminate its exterior. Winner of the Small Project Award at the World Architecture Festival in 2012, Marina Bay’s Circle Line Section of the Mass Rapid Transit (MRT) station is more than just a train station. Its design hinges on elements of efficiency, visibility, and integration to create an outdoor facade that makes complete use of the environment. The result is a truly remarkable structure that provides more than just shelter from the elements. Such a marvel in design, even in an MRT station, is a testament to the Land Transport Authority and Singapore’s government willingness to invest in the quality of our nation’s infrastructure. This is but one example of why Singapore is consistently ranked among the top in surveys that list the best public transportation systems in the world. Kampung Admiralty is an integrated retirement village that has recently earned recognition at the internationally renowned World Architecture Festival. With a Malay name that translates into ‘Admiralty Village’, Kampung Admiralty sought to bring to life the government’s aims to fully integrate the needs of our nation in one housing unit. These include issues concerning housing, education, and healthcare — all of which Singapore has consistently come out on top. Within one village, Kampung Admiralty combined public housing for senior citizens, complete with easy access to healthcare and even childcare services. For these reasons, Kampung Admiralty beat over 500 projects that were submitted from all over the world without breaking a sweat. The Interlace is a multi-award-winning ‘vertical village’ that is yet another highly innovative housing solution. Located close to the Alexandra Arch in Harbourfront, this private residential complex is noteworthy for its striking, contemporary architecture. In its conceptualisation stage, its architects had envisioned a residential building that defied traditional isolating skyscraper designs, believing that they were all too common in urban housing. This ‘vertical village’ features six-storey blocks that are stacked on top of each other to form a maximum of 24 floors. The Jenga-looking facade of the architecture lays staggered with a hexagonal arrangement that encloses eight courtyards. Even its swimming pools have been integrated into its overall aesthetic within each courtyard. This uniqueness in design led The Interlace to clinch the top prize at the World Architecture Festival in 2015, where it was named the ‘‘World Building of the Year’. The building was also presented with the Urban Habitat Award in 2014.